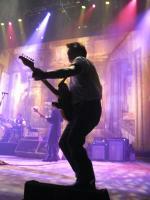 John Mellencamp Community > MELLENCAMP DISCUSSION > No Better Than This Tour Talk > Columbia, SC > Who's Going? i'm considering this show. i have a sister that lives near Columbia and she hasn't seen JM in 15-20 years. My wife and i will be there. Sec b row h. looks like a very nice venue. I completely understand, Paula. We are not going to the 2nd show in Bloomington because we will not miss our grandson's birthday. It just hit me the Columbia show is in a few weeks! Columbia SC show, anyone have pictures or video? My Dad and Step-Mom attended the Columbia show last night and my Step-Mom was the lucky lady who was pulled on stage at the end of the show. I was wondering if anyone has video or pictures, as my dad didn't get any because I think he was in a state of shock. Any help would be appreciated. I took a pic, but it was too blurry! I think she was in shock, too.